Duro-Sense compression fittings allow the thermocouple immersion depth to be set in the field. They are available in both adjustable and non-adjustable/fixed styles. They are available in both stainless steel and brass. The internal ferrule or sealant glands are available in a variety of materials depending on the application. Compression fittings are rated up to 3000psi depending on temperature and sheath diameter. Duro-Sense adjustable compression fittings can be relocated at different positions along the thermocouple sheath whenever changes in the immersion depth are necessary. To relocate an adjustable compression fitting, simply loosen the cap, slide the fitting into the new position and retighten the cap. 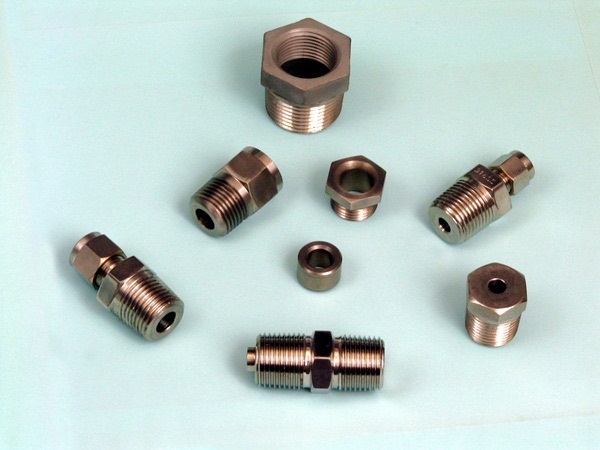 Adjustable compression fittings have a stainless steel body and an internal ferrule or sealant gland of Tetrafluorethylene (TFE) Teflon. 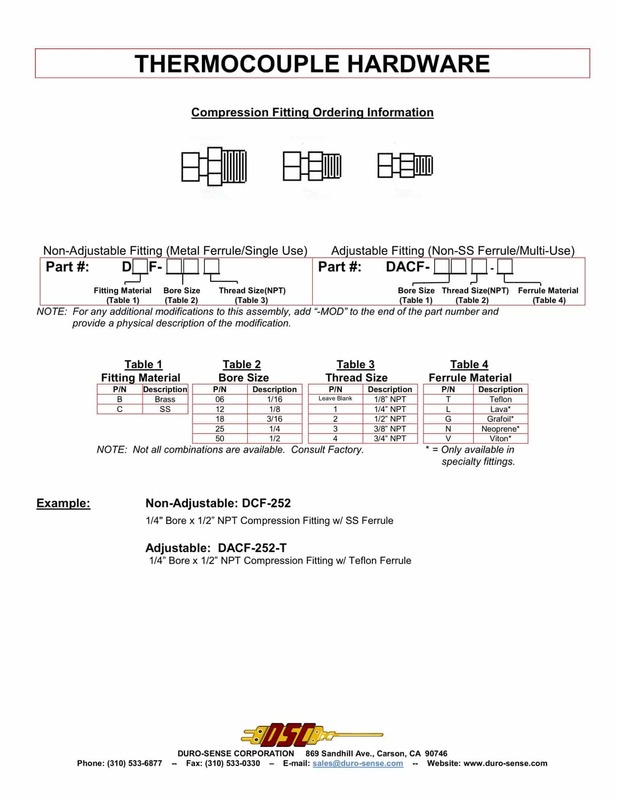 Additional ferrule materials are available for specialty fittings only. TFE ferrules are rated at -300ºF to 500ºF (-184ºC to 260ºC). TFE ferrules should withstand several relocations before replacement is necessary. Duro-Sense non-adjustable compression fittings cannot be relocated once they are tightened. Since the ferrule or sealant gland is made from stainless steel, once it is tightened the ferrule and the thermocouple sheath are deformed and do not allow for relocation. When ordered as a part of a thermocouple assembly, all compression fittings are shipped loose or finger-tight on the thermocouple sheath. Duro-Sense fixed fittings are either brazed or welded to the thermocouple sheath and are permanent. They are available with threads on one or two sides. The two-sided fitting is also available in a spring-loaded version.